What is urban life without a little excitement, spontaneity and strangeness? A popular article on unusually legal street art prompted some of our readers to inquire about organizing or attending flash mob events. The internet has, fortunately, made the organization of these urban events a whole lot easier. 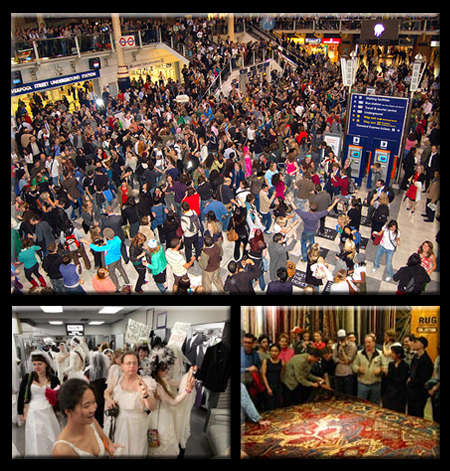 However, flash mobs aren’t just about gathering at a store to stare at a carpet. Subway parties and subway installation art vary in terms of legality, but can add some color and interest to an otherwise uneventful ride. Of course, subway cars provide some interesting built-in features, such as poles for dancing, in addition to party favors brought on board. 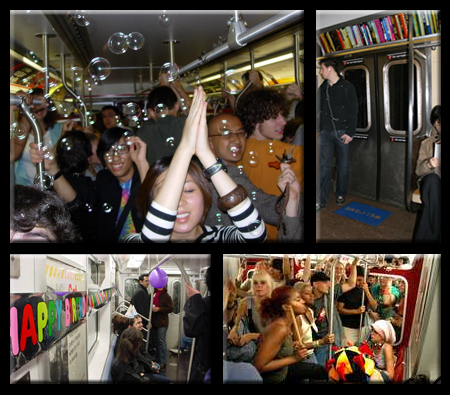 Some subway parties have themes, while others are simply named with the color or number of the train or line. 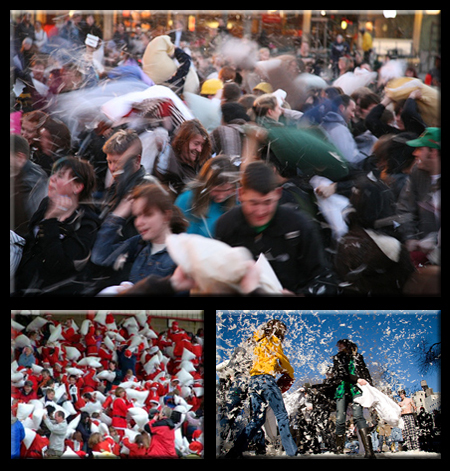 Believe it or not, a popular kind of spontaneous urban gathering is a pillow fight flash mob. These can have all kinds of interesting themes including Christmas, resulting in the Santa pillow-fighting squad seen above. Some of these affairs, such as a recent pillow fight on the streets of San Francisco, have even been caught on video.